It’s official! The Chair Salon has been awarded the prestigious accreditation of Easilocks Ambassador. Easilocks Ambassadors represent the most experienced stylists, who have completed all Easilocks advanced training modules to the highest standard. The Chair joins an elite group of just twenty salons across the United Kingdom who have achieved this coveted status. Extensive training in six modules is required to be awarded an ambassadorship. The initial modules include Easilocks’s classic strand by strand technique using Easi-tip strands and microscopic sized Easilocks, together with advanced placement techniques. Renowned because it requires no heat, glue, sewing or braiding and therefore causes no damage to the natural hair, the Easilocks system is beloved by clients and celebrities. Easilocks hair extensions are also reusable – your stylist can remove and reattach all or just some of the strands numerous times, giving you total control over your look. Further training modules perfect the application of Easilocks’ all-new Easitape micro tab hair extensions and Easilocks Multi-Weft. Easitape extensions have a rapid release and removal time, making reapplication a cinch and providing the perfect solution for time-poor clients. Easilocks Multi-Weft was created for those clients who prefer the look and performance of a weave but want it without the damage to the hair or the bulky plait traditionally used to create a weave. It can also be used as a casual wear clip-in. The final modules take techniques to the next level, perfecting hair integration and blending whilst refining the Easilocks’ performance and enhancing creative cutting and styling of extensions. 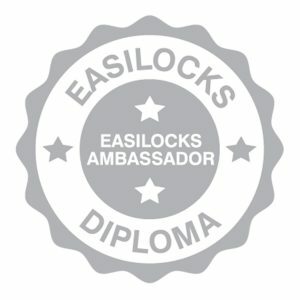 We are so proud to be recommended as elite Easilocks Ambassadors and look forward to introducing more clients to Easilocks and applying our advanced techniques in the care of your Easilocks hair extensions. Visit our Instagram page for inspiration and many ‘before and after’ Easilock hair extensions photos and please feel free to ask any questions about this revolutionary system. To celebrate our ambassadorships we have a fantastic Easilocks offer for November – see our offers page and Easilocks Giveaway blog post for full details!